Provide the perfect final touch on your outdoor masonry cabinet. 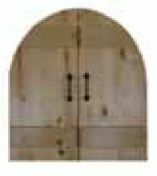 The Stone Age Manufacturing Unfinished Arched Cabinet Door for Wood Storage Cabinets does just this. Coming unfinished and ready for staining, you can make this door look however you want with the use of stain! It is pre-measured to fit snugly in your arched lintel wood storage cabinets. So if you're looking for a door you can customize yourself, Stone Age Manufacturing gives you exactly what you're looking for!